Orber (Aquiles) Moreno was born on April 27, 1977 in Caracas, Venezuela. The tall slender right hander was signed at the age of sixteen by the Kansas City Royals. 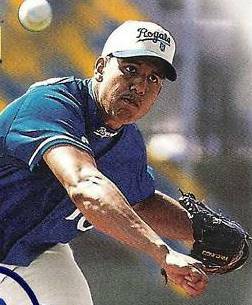 He would spend six years in the minors as a starter, reliever even a closer at times before debuting with the Royals in 1990. He appeared in seven games posting a 5.63 ERA with six strikeouts in eight innings of work. 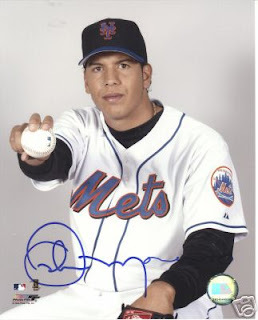 In 2003 he was signed by Jim Duquette & the New York Mets during Spring Training. He went 5-1 posting a strong 1.90 ERA in 38 games at AAA Norfolk, getting a September call up to Shea Stadium. He debuted on September 3rd in a game against the Braves & was greeted with a two run HR by Javier Lopez, but he got no decision in the 9-3 loss. He had another rough outing in Florida as the Marlins tagged him for four runs & in seven games he posted a 7.88 ERA on the season. In 2004 he made the club after a good Spring Training, and in the second game of the season was greeted with a two run double from Atlanta’s Andruw Jones in the wild 18-10 Braves win. Moreno earned his first save two days later in Montreal. AT the end of Mat he got his first career win, pitching two innings of scoreless relief in Philadelphia. On July 4th he came into a subway series game at Shea Stadium, ahead 5-4 in the 8th inning. But he blew the lead allowing two hits & the tying run to score. He was saved by Ty Wiggington who hit a dramatic 8th inning HR, giving Moreno credit for the Met victory. He would earn one more win before getting demoted at the end of the month. He went 3-1 with a 3.38 ERA in 33 appearances that season but never pitched in the major leagues again. He finished his MLB career at 3-1 in 47 games with a 4.44 ERA. He pitched in the minors through 2008, then in the Mexican League in 2009 & the Independent League in 2010.